The UCSF Abdominal Transplant Fellowship is a two-year fellowship program for those who have completed General Surgery training and wish to specialize in multi-organ abdominal transplant surgery. Our training program is approved by the American Society of Transplant Surgeons (ASTS) to train in kidney, liver, and pancreas transplantation. Our fellows will receive advanced training in deceased and living donor organ procurement as well as renal, pancreas, and liver transplantation. As a tremendously busy, high volume transplant center, all of our fellows receive ample exposure to the entire spectrum of pre-, peri- and post-transplant patient care. Our fellows rotate through three primary roles for eight months each. 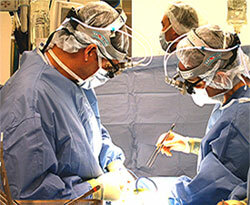 There are two clinical rotations, the Kidney/Pancreas and the Liver Transplant Services, and a Donor / Research rotation. Typically, fellows spend two or four continuous months on a rotation and then switch. There is no predetermined order for the rotations.